Tha Gàidhlig ga cheangal an diugh ri Innse Gall, agus tha e furasta dìochuimhneachadh gum b’e Gàidhlig cainnt na coimhearsnachd uaireigin do sgirean gu math faisg air Baile Ghlaschu fhèin. Chan eil ach dà ghinealach no trì bho chaidh Gàidhlig na tàmh ann an sgìrean Chomhghall, Arain, Bhòid, is pairtean de Shiorrachdan Dhùin Bhreatainn, Siorrachd Shruighlea agus Siorrachd Pheairt. Thathar fada an comain an Dr Mìcheal Newton a cheadaich na mapaichean seo, gu h-àrd is gu h-ìosal, a chleachdadh. Seo bhon leabhar, M. Newton, ‘Bho Chluaidh gu Calasraid. 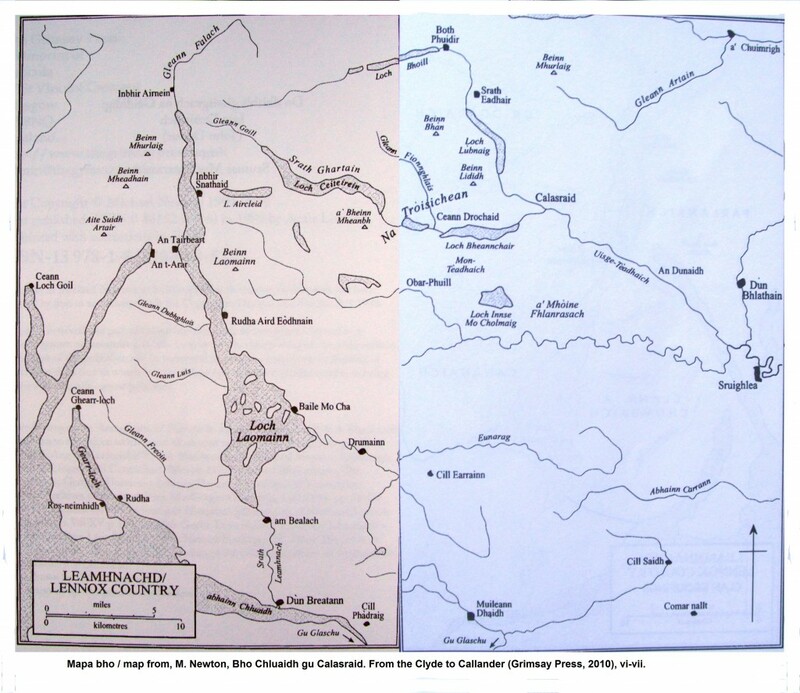 From the Clyde to Callander’ (Grimsay Press, 2010), tdd. vi-ix. Bha sgìrean na ‘Gaidhealtachd’ leis an seo – sin far an robh sluagh na tìre a’ bruidhinn na Gàidhlig tòrr mòr na b’ fhaisge air baile Ghlaschu na shaoileas daoine an diugh. Chithear sin gu soilleir air a’ mhapa gu h-àrd, a’ sealltainn crìochan na Gàidhlig mu àm Bliadhna Theàrlaich (1745-6). Bha seo an dèidh linn na dhà de chrìonadh-cànain ann an àitean mar Siorrachd Shruighlea is Siorrachd Dhùin Bhreatainn. Na h-ainmean-àite le dreach na Gàidhlig orra. Thathar fada an comain an Dr Mìcheal Newton airson cead am mapa a chleachdadh. M. Newton, Bho Chluaidh gu Calasraid (Grimsay Press, 2010), vi-vii. Cha deach Gàidhlig a theagasg aig Oilthigh Ghlaschu mar chuspair a ghabhadh oileanach mar phàirt de chùrsa-ceum gu 1906-07. Ach tha Gaidheal air a bhith a’ frithealadh an oilthigh on a chaidh a stèidheachadh ann an 1451, agus gabhaidh buidhnean beaga de Ghaidheil am faicinn am measg an t-sluaigh ann an gach linn fa leth aig an Oilthigh. 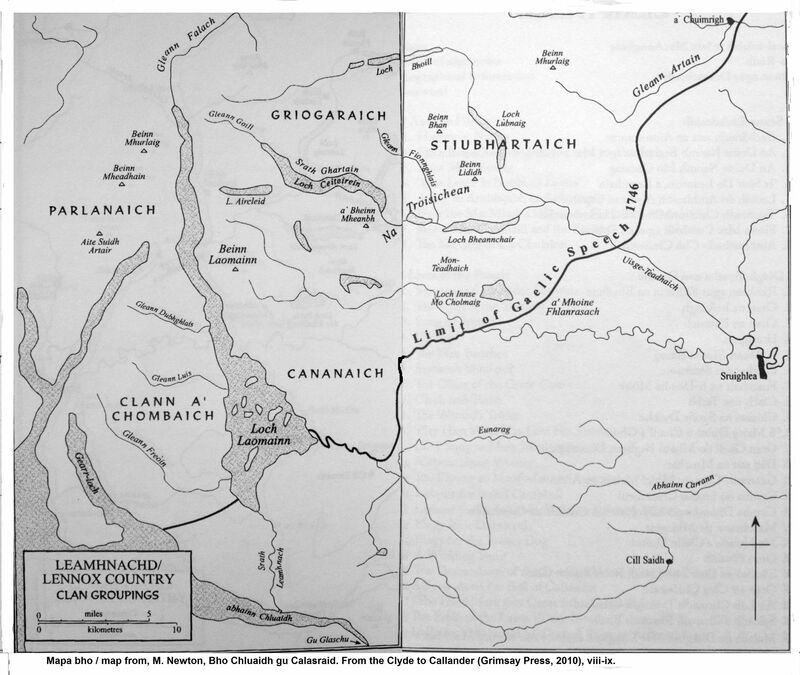 Chan eil ach mu 1% de dh’ Albannaich a’ bruidhinn na Gàidhlig anns an latha an diugh, ach an rèir Iain Major, Prionnsabal an Oilthigh, 1518-23, bha dàrna leth de shluagh na h-Alba a’ bruidhinn Gàidhlig mar chiad cainnt anns an latha aige fhèin. Chan ann a-mhàin ann an sgìrean “Ghaidhealach,” far am biodhte an dùil ris an leithid, ach cuideachd shìos mu dheas ann an sgìre Charraig (Siorrachd Air). B’ ann à Carraig a bha am bàrd ainmeil Ualtar MacUalraig a cheumnaich le MA o Oilthigh Ghlaschu, 1478. Chaidh MacUalraig a chàineadh airson a chuid Gàidhlig agus a chuid cleachdaidhean Gaidhealach ann an aoir a rinn Uilleam Dunbar, bàrd ainmeil eile air, is an dithis aca a’ magadh air càch a chèile. Fhreagair MacUalraig gum b’i a’ Ghàidhlig a bu chòir do dhaoine treibhdhireach, ceart, a bhith a’ bruidhinn. Is fhiach a bhith mothachail, ge-tà, nach eil lorg againn air sgrìobhadh sam bith le MacUalraig ann an Gàidhlig ged a tha grunnan mhath de dhàin aige a chaidh a sgrìobhadh ann an Scots (lean an ceangal eadar MacUalraig is Oilthigh Ghlaschu oir chaidh a mhac, Ualtar eile, a dheanamh mar reactor an Oilthigh ann an 1524). [ 4 ] Tha sin na chomharra, gu ìre, air seasamh an dà chànan ann an inntinn dhaoine. Ged a b’ i a’ Ghàidhlig a bh’air bilean an dàrna cuid dhan t-sluaigh mu 1500, b’ e Scots agus Laideann a bha a’ cunntadh mar chànanan “adhartach” ann an seagh foghlam, malairt agus riaghladh – gu h-àraid ann am mòr-bhailtean na Galldachd. Tha e glè fhollaiseach dè bha daoine a’ sgrìobhadh (ma bha na daoine sin a’ sgriobhadh ann an Scots), ach tha e do-dhèante a radha le cinnt dè na cànanan a bha daoine a’ bruidhinn gu h-eachdraidheil. Ach mas ann do sgìrean Ghaidhealachd a bhuineadh iad feumaidh e bhith gu robh Gàidhlig aca. Lean na h-uaislean uile ann an sgìrean Gaidhealach le labhairt na Gàidhlig gu ruige meadhan an 18mh linn, ged nach robh iad ri sgrìobhadh na Gàidhlig ach corr uair. Far nach robh comas labhairt aig daoine ann an Gàidhlig air Ghaidhealtachd ge-tà – gu h-àraid sagairtean agus ministearan – bha seo a’ togail ghearainean – no ga chleachdadh mar leisgeul airson ghearainean. [ 7 ] Far an robh gearainean, bha pàipear, agus ma chaidh na pàipearan an glèidheadh tha fianais againn orra. Tha gearainean leithid seo a’ ciallachadh gu bheil sealladh eachdraidheil againn air cleachdaidhean cainnt dhaoine ron Ath-leasachadh (1560). Tha leabhar ùr aig Iain G. Macdonald, Clerics and Clansmen, air sgrùdadh a dheanamh air an aimhreit a bh’ ann an Earraghaidheil nuair a chaidh sagartan gun Ghàidhlig a sparradh air choitheanalan san sgìre [http://www.brill.com/clerics-and-clansmen]. Tha e soilleir o na gearainean sin nach robh Gàidhlig aig na coigrich ach chan eil teagamh ann gu robh Gàidhlig aig sagartan le ainmean ‘Ghaidhealach’ às an sgìre fhèin. Is e glè bheag de chlèir na h-eaglais an Earraghaidheal a bh’ air an oideachadh aig Oilthigh ro 1451. Ach thug stèidheachadh Oilthigh Ghlaschu buaidh mhòr air an sgìre. A rèir MacDonald, thug an Oilthigh ùr grad thionndadh air foghlam an Earraghaidheal agus na h-eileanan mu dheas, le deann dhiubh a’ cur aghaidh air foghlam an Glaschu. Thill aona dhiubh sin Archibaldus Campbell (Gilleasbaig Caimbeul), 1453, bho Oilthigh Ghlaschu a dh’ Eilean Lios Mòr (far a bheil Gàidhlig fhathast ga bruidhinn) agus bha e na shagairt an sin. Bha corra dhuine o Earraghaidheil a’ frithealadh oilthighean eile anns a’ chiad-ceud bliadhna an dèidh dhan Oilthigh tòiseachadh an Glaschu agus chithear cuideachd daoine leithid na Combaich agus clann Bhochanain bho na sgìrean mun cuairt. Tha iomradh ann an clàraidhean an Oilthigh ann an 1470 air còignear oileanach ann an le ainmean annasach: Finlaus Scot de Insulis, Archibaldus de Insulis, Gilbertus de Insulis, Moricius de Insulis agus Dominus Malcomus de Insulis (gu h-ìosal). 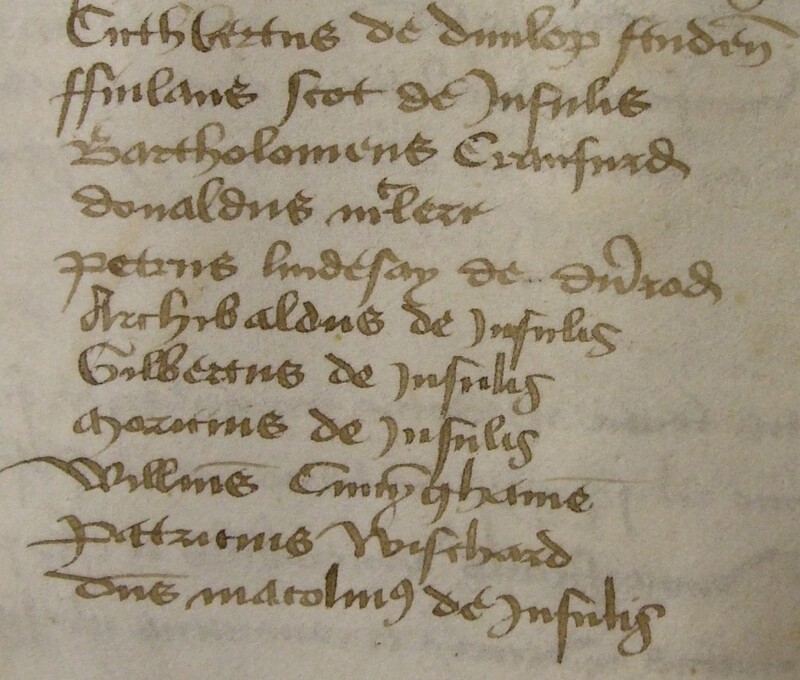 Liosta de dh’ oileanaich mar a tha iad sgrìobhte ann an clàraidhean an Oilthigh, 1470, còigear bhalaich leis an t-ainm ‘de insulis,’ de (no às?) na h-eileananan, nam measg. An dealbh seo air a chleachdadh le cead o Thasglann Oilthigh Ghlaschu (University of Glasgow Archive Services, University collection, GB0248, GUA 26613/38). Is e Earraghaidheal an sgìre dhan Ghaidhealtachd is dlùithe de Ghlaschu agus b’e ceannardan na Caimbeulaich na daoine a bu chumhachdaich anns an t-siorrachd sin. B’ e Gilleasbaig Ruaidh Òig a theirte ri ceann-fine nan Caimbeulach, 1529-1558 (an 4mh Iarla). Chaidh iompachadh chun chreideamh Phròstanach mu 1536, agus lean an fhine e air fad. Thug ceannardan nan Caimbeulach cuireadh dhan searmonaiche ainmeil, Iain Nocs a thighinn a theagasg dhaibh ann an 1556. Bha seo a’ ciallachadh, air thàillibh taic nan Caimbeulach, gum b’e a’ chreideamh Pròstanaich a bu bhuadhach san sgìre sin agus bha am fine daingeann nan cuid taic do dh’ Ath-leasachadh na h-Alba, nuair a chaidh gabhail ri Eaglais ùr Phròstanach na h-Alba mar eaglais stèidhichte na dùthcha ann an 1560 agus cùlaibh a chuir ris an eaglais Chaitligeach. [ 10 ] Ach, eaglais ùr ann no às, bha a’ cheart uiread de dh’ fheum aca air foghlam, agus chuir an eaglais ùr luach mhòr air oideachadh aig oilthighean leithid Ghlaschu. Bha aonan de na h-oileanaich sin air a bheil iomradh gu h-àrd, Seán MacColgáin, no John Colgan, a bha aig Oilthigh Ghlaschu, c. 1605-1607, air fear dhiubh sin a rinn air tìr mòr na Roinn Eòrpa. Thathar dhan bheachd gur e am fear seo an aona Seán MacColgáin (c.1592-1658) a bha na bhràthair Francisganach agus na sgoilear chliùiteach aig Colaiste an Naomh Anthony ann an Louvain. B’ ann o theaghlach ainmeil de phearsachan-eaglais a bhuineadh Mgr MacColgáin, o sgìre Innis Eoghain ann an Dún na nGall. Cha robh mòran chothroman ann a thaobh dreuchd nan sagart ri linn tuineachadh Ulaidh, 1609, agus is dòcha gur ann air thàillibh sin a dh’ imich e gu tìr mòr na Roinn Eòrpa uaireigin mu 1612. Chan eil e soilleir càite an robh e trèanadh mar shagart, ach chaidh a thoirt a-steach mar bhall dhan Cholaiste ann an Louvain e ann an 1620. 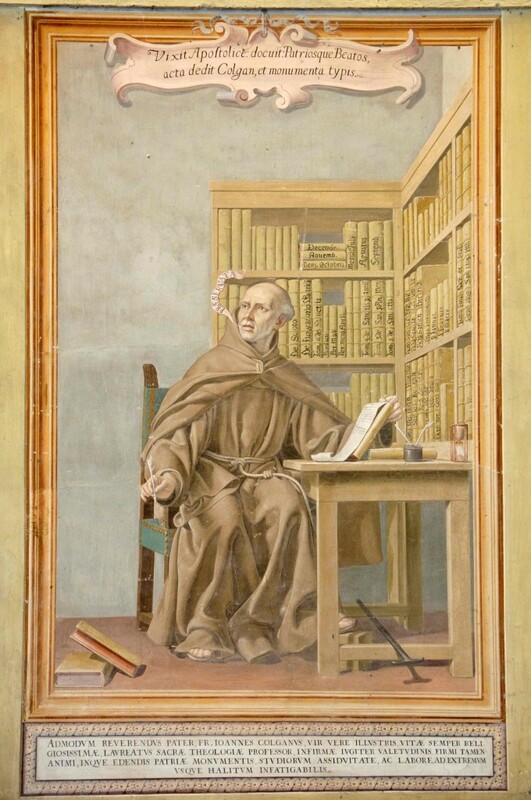 An dealbh-camara, deas, le Patrizio Gioberti, Roma, de fresco a chaidh a dheanamh le Friar Emanuale da Como, mu 1670 ann an Caibeal San Isidoro, An Roimh, de Mhgr Seán MacColgáin. Le taing don t-Àrd Oll. Mícheál MacCraith, Ollscoil na hÉireann, Gaillimh, airson cead na dealbh seo a chleachdadh. Bha pròiseact aca aig Colaiste Louvain ann a bhith a’ sàbhaladh, a’ dìon, agus a bhith ag ath-chruthachadh nan seann làmh sgrìobhainnean chràbhaidh bhon t-seanna-Ghàidhlig, leithid cunntasan-beatha nan naomh, agus gan ath-fhoillseachadh (ann an Laideann) mar dhòigh air neartachadh a’ chreidimh Chaitligeach. Leis na comasan a bh’aig Mgr MacColgáin mar sgoilear Laideann agus Gaeilge, cha robh e ro fhada gus an robh e an sàs anns an obair sin. Bha MacColgáin na àrd-ollamh diadhachd aig Louvain o mu 1635. Dh’ fhoillsich e iomadach cunntas-beatha nan naomh, leithid an Naomh Colm Cille, an Naomh Pàdruig agus an Naomh Brìghde. Ged nach robh a shlàinte ro mhath fad grunnan bhliadhnachan, chuir e mach iomadach leabhar ann an Laideann anns an dòigh seo, le bhith a’ tarraing stuthan o sheann-sgrìobhainnean Ghaidhealach agus gan cuir an clò san Laideann, leithid Acta sanctorum Hiberniae (1643) agus, Triadis Thaumaturgae (1647). Duilleagan aghaidh dà leabhar le Mgr Colgan ann an leabharlann Oilthigh Ghlaschu. An Acta Sanctorum (1645) agus Triadis Thaumarargae (1647). Na dealbhan seo air an cleachdadh le cead bho Special Collections, Leabharlann Oilthigh Ghlaschu. [ 1 ] ‘…I myself remember a time when the inhabitants of the shires of Stirling & Dumbarton spoke pure Gaelic. But nowadays that tongue is relegated… …so that one rarely comes upon any who speak it…’ Briathran Sir Thomas Craig an seo air eadar theangachadh on Laideann chun Bheurla le, C.S. Terry, ed., De Unione Regnorum Brittaniae Tratatum, by Sir Thomas Craig. Edited from a manuscript in the Advocates’ Library (Scottish History Society, Edinburgh, 1909), 288-9. Seallaibh cuideachd, M. Newton, Bho Chluaidh gu Calasraid. From the Clyde to Callander. Gaelic songs, poetry, tales and traditions of the Lennox and Menteith. In Gaelic with English translations (Grimsay Press, 2010). [ 4 ] Priscilla J. Bawcutt, ‘Kennedy, Walter (1455?–1518? )’, Oxford Dictionary of National Biography, Oxford University Press, 2004 [http://www.oxforddnb.com/view/article/15395, accessed 2 Dec 2013]. http://www.universitystory.gla.ac.uk/biography/?id=WH18032&type=P&o=&start=60&max=20&l= Airson a mhac, Reactor ann an Oilthigh Ghlaschu, seallaibh cuideachd: C. Innes, ed., Munimenta Alme Universitatis Glasguensis [MAUG] (4 vols., Maitland Club, Glasgow, 1854), ii, 150. [ 6 ] N. Lamont, ed., Inventory of Lamont Papers, 1231-1897 (Scottish Record Society, Edinburgh, 1914), 38. [Chithear leabhar mu phàiprearan Chlann MhicLaomuinn air an t-eadar-lìn, aig: <https://archive.org/stream/scottishrecordso54scotuoft#page/n7/mode/2up>]. Durkan & Kirk, The University of Glasgow, 1451-1577, 306, 400. [ 7 ] I. G. MacDonald, ”That uncouth dialect’: English-speaking clergy in late Medieval Gaelic Scotland’, ann an Records of the Scottish Church History Society, 43 (2014), 1-29, aig 2, 29. [ 8 ] Airson buill-teaghlaich cheannardan Chloinn Dòmhnaill, Triathan nan Eilean, seallaibh, J. Munro & R.W. Munro, eds., Acts of the Lords of the Isles, 1336-1493 (Edinburgh, 1986), 278-315. [ 9 ] Ian Macdonald, Clerics and Clansmen. The Diocese of Argyll between the Twelfth and the Sixteenth centuries (Brill, Leiden, 2013), 208-209, 210-212, 218-223, 362-365. C. Innes, ed., Munimenta Alme Universitatis Glasguensis [MAUG] (4 vols., Maitland Club, Glasgow, 1854), ii, 70. Chithear an leabhar seo aig: <https://archive.org/stream/munimentaalmeuni03mait#page/n7/mode/2up>. Airson teaghlaichean nan Aos-dàna, seallaibh ri alt leis an t-Ard Oll. Ruairidh MacThòmais, nach maireann, ceannard na Ceiltis aig Oilthigh Ghlaschu (1963-1991). D.S. Thomson, ‘Gaelic learned orders and literati in Medieval Scotland,’ ann an Scottish Studies 12 (1968), 57-78. Seallaibh cuideachd alt leis an Dr Màrtainn MacGriogair, òraidiche an Eachdraidh aig Oilthigh Ghlaschu: M. MacGregor, ‘Church and Culture in the late medieval Highlands,’ ann an J. Kirk, ed., The Church and the Highlands (Edinburgh, 1998), 1-35. [ 12 ] MAUG, iii, 3-24, 60-95. [ 16 ] J. Durkan (J. Reid Baxter, ed. 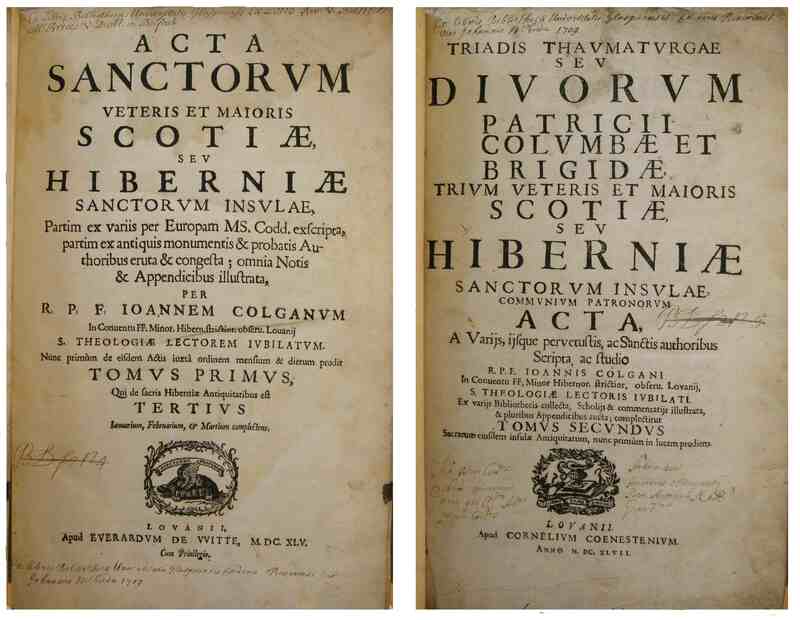 ), Scottish Schools and Schoolmasters, 1560-1633 (Scottish History Society, Woodbridge, 2013), 192. ‘Extracts from the Registers of the Presbytery of Glasgow, from November 1592 to March 1602’ ann an, J. Dennistoun & A. Macdonald, eds., Miscellany of the Maitland Club, vol 1, part 1 (Glasgow, 1833), 51-96, aig, 90, 94. [ 17 ] MacCuarta, Catholic Revival in the North of Ireland, 1603-41, 28-29 B. MacCuarta, ‘The Catholic Church in Plantation Ulster,’ ann an, É Ó Ciardha & M. Ó Siochrú, eds., The Plantation of Ulster. Ideology and Practice (Manchester, 2012), 119-142, aig 121-2. Ged a tha sin ceart anns an fharsaingeachd gheibhear duine ann an siud is ann an seo nach robh a’ tighinn leis a’ phàtran àbhaisteach, leithid, Jeremie O’ Queine, Èireannach aig an robh Gaeilge mar chainnt agus a cheumnaich o Oilthigh Ghlaschu ann an 1644. Ged a b’ e Gaidheil Èireannach a bh’ ann an O’ Queine bho thùs bha e na chlèireach à Siorrachd Aontram. Chaidh dreuchd mhinisteir aig Inbhir Aora thabhainn air aig aon àm – ged nach eil fianais ann gun do fhreagair e an cala sin. F. Macdonald, Missions to the Gaels. Reformation and Counter-Reformation in Ulster and the Highlands and Islands of Scotland (Edinburgh, 2006), 111-112. [ 18 ] C.N. Ó Clabaigh. ‘Colgan, John,’ anns an Dictionary of Irish Biography (Royal Irish Academy & Cambridge University Press), air an t-eadar-lìon: http://dib.cambridge.org/. P. Ó Riain, ‘The Louvain achievement II: Hagiography,’ ann an E. Bhreathnach, J. MacMahon & J. McCafferty, eds., The Irish Franciscans, 1534-1990 (Four Courts Press, Dublin, 2009), 189-200. C. Mooney, ‘Fr John Colgan and the Louvain school,’ in N. Ó Muraíle, ed., Mícheál Ó Cléirigh, his associates and St Anthony’s Colllege, Louvain (Four Courts Press, Dublin, 2008), 225-230. Thathar fada an comain an Dr Geraldine Parsons, Oilthigh Ghlaschu, airson fiosrachaidh. [ 19 ] N. Canny, Making Ireland British, 1580-1650 (Oxford, 2001), 442, 450-454. Bha oileanaich a bha a’ frithealadh Oilthigh Ghlaschu rè na seachdamh agus na h-ochdamh linn deug gu math tric a’ sgrìobhadh gu robh iad nan Èireannaich le bhith a’ cur ‘Hibernus’ no rudeigin leithid sin ri taobh an cuid ainm. Ach b’ e ainmean leithid Cunningham, Caldwell is Montgomerie a bh’ air a’ mhòr chuid aca, a’ sealltainn gur ann o shliochd Albannach a bhuineadh iad. Ged is e ‘Hibernus’ a sgrìobhadh iad b’ ann mar Albannaich no mar Shasannaich a bha iad gam faicinn fhèin agus gu math tric, gu h-àraid o na 1690an air adhart, bha iad sin na bu bhuailtiche air a bhith a’ toirt Anglo-Hibernus no Scoto-Hibernus orra fhèin nuair a bha iad a’ clàradh aig an Oilthigh. MAUG, iii, 41-59. 115-256.